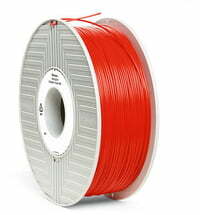 High-quality 3D printer filaments. Manufactured under strict tolerance limits and with the use of high grade materials for even material loading and excellent printing results. Verbatim is part of the Mitsubishi Chemical Holdings Group, a leading global plastics manufacturer. Below, you will find a table outlining the basic characteristics of the various types of Verbatim filaments. Product features Harder and impact-resistant. Often used for mechanical parts or weatherproof components. Typically easier to print. Very flexible. Very good resistance to heat, oil and chemical. Good mechanical strength. 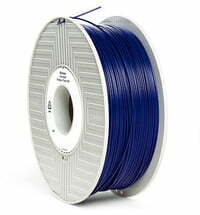 Frequently used and approved filament. Hardness Hard, impact-resistant, sturdy, with good flexibility. Hard but brittle when bent when compared to the ABS filament. Higher risk of breakage during bending. Creates objects with rubbery surface like grip coatings for tools, automotive parts, gaskets, waterproof containers, medical bags, rubber buttons, hoses, etc. Application Heater bed is recommended. Heater bed not required. Heater bed is recommended. Vulnerability Higher resistance to moisture, sunlight and overheating during processing. Generally strong and resistant to chemicals. More prone to moisture and sunlight, as well as overheating during processing. May start to drip when overheated. Low hardness. Appearance Typically glossy, but can vary greatly. Different levels of transparency possible. Environment and Recycling Recycling code classification 7, i.e, recycling is possible, however, many local recycling collection points do not accept ABS materials. Adopted ABS materials with classification number 7 are recycled into plastic lumber (recycled plastic panels). PLA is a bioplastic that decomposes. However, outside an industrial composting plant decomposition takes place very slowly. Opportunities for recycling and commercial composting are available, but require additional effort on the part of the consumer. Dispose of at incineration plants or waste disposal in accordance with the local and national municipal regulations. Engineers prefer ABS filaments due to its strength, flexibility, tensibility and better temperature resistance. It also finds use in professional applications. The smell of heated plastic and its mineral oil origin, may by daunting to some. The additional need for a heated print bed means that some printers are not simply able to reliably print with ABS. Should the user experiencing problems with warping, the pressure bed is either not hot enough or the height is not properly adjusted. The bed should have a minimum temperature of 80 °C depending on the printer. The nozzle should be distanced approximately 0.2 mm away from the print bed (about the thickness of a sheet of paper). The wide range of colours available, light transmissions and the glossy feel, often attracts those who print for illustration purposes or for household use. Many appreciate the plant origin and prefer the semi-sweet odour. With proper cooling, PLA seems to have a higher maximum printing speed, lower layer heights and sharper printed corners. This, in combination with lower warping of components, contributes to the popularity of the material for home printing and creative outlets at schools. Biodegradable, made from corn plastic. Prints at temperatures of approximately 180-230 °C and does not warp, enabling the processing of large prints without using a heated pressure bed. PLA is more "oozed out" than ABS - if the nozzle is heated with plastic contained in it, it will drip. Due to low melting temperatures, it is advised to store PLA away from direct sunlight and cool places during summer. Should I use PLA or ABS? ABS softens at higher temperatures, which means that your device takes longer to reach those temperatures before it is ready to print. 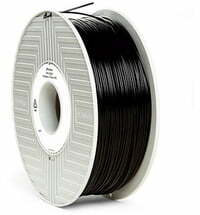 It also has poorer adhesion properties, therefore many printers that use ABS material have an improved material adhesion over a heated print bed. 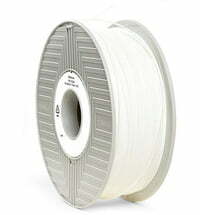 Conversely, PLA cools and adheres faster, and can therefore be printed at a higher speed. If components are printed that are used in a warm environment such as housing for a printer fan, ABS would be a better option, to avoid deformation of the particular component. Differences can be found post-production too: ABS is aceton-soluable, therefore it can be applied to the prints to smooth bumps and surface damage. Acetone does not affect PLA. PLA however generally produces smoother prints. Since some printers only work with one of the two plastics, this should be verified prior to experimentation. PRIMALLOY ™ is a soft rubber material with excellent heat, oil and abrasion resistance and mechanical strength. It is a high-performance thermoplastic elastomer (TPE) based on polyester. The uniform diameter ensures an optimal homogeneous filament and thus smooth printing processes. Manufactured in Japan using the highest quality materials and with very strict tolerances, for a uniform inflow and reliable printing results. PRIMALLOY ™ is a registered Mitsubishi Chemical Corporation trademark. All filaments are delivered vacuum-packed (with desiccant) on a spool. Find the Verbatim filaments here.